Family details of each man, mainly from the 1911 Census. 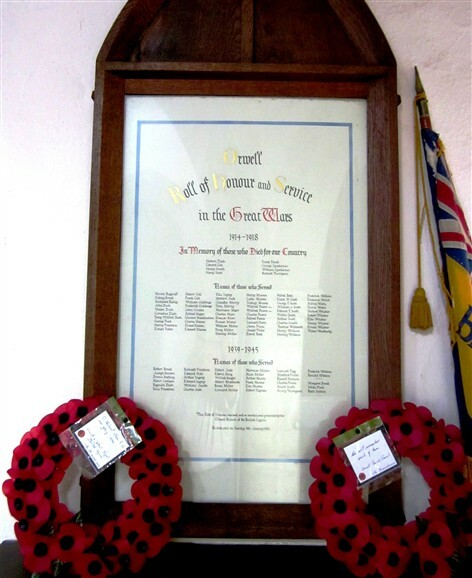 The Roll of Honour in Orwell Church includes all the Orwell people who fought in both World Wars. Link to "National Roll of Honour." The military details of each man, so far as they are known, can be found on the "Roll of Honour." Orwell has no stone war memorial. The names of those from the village who served in the two World Wars of the 20th century are written on a wooden panel in the south aisle of the parish church of St Andrew. Even this panel cannot be taken to be complete and accurate, however. It is unclear what criteria were applied in deciding who were "our lads," and who belonged to another village. Probably, some names appear on more than one village memorial. It is, however, reasonable to suppose that the list on the panel, which was prepared by the villagers at the time, is the best guide to who was from the village and who was not. There is an obituary to Len Miller, who survived harsh treatment by the Japanese in Singapore, here on this website. His medals, and some poignant postcards home, are on display in the Village Hall. For the Great War, the 1911 Census gives us a snapshot of the lives of some of these men, just a few years before they went off to serve. Further details of their family lives, both before and after their service, would be most welcome to complete the story. The life of Florence van Stockum was affected to such a degree by the first World War that she gets her own page on this website. David Reed, shown in the photo, was born in Orwell in 1879, at an address given in 1881 as High Street. His parents were Arthur Reed and Isabel (the Census return gives her name as Elizabeth, but we think this is a mis-reading.) By 1911, he was married to Emily, and lived in Royston. He was a wheelwright. His children in 1911 were given as Arthur George, Bernard, and Cyril David. However, one of the children shown in this photo is a girl, and in any case the military uniform indicates that the photo was taken post 1914. The children in the picture would not have been born at the time of the 1911 Census. His brother Alfred, born in Orwell in 1883, also served. See later for his details. Herbert Dash: Born at Malton Cottages 1894. Boy entrant in 1911 with the Royal Navy, stationed at Portsea. He was on board "The Black Prince," which was shelled and sank with all hands at the Battle of Jutland in 1916. Edward Gill: There are two Edward Gills, both born in Orwell, in the Census. One is aged 24 in 1911, and the other 32. Both have married and live well away from the village. Neither appear in the Parish registers, but the fathers of both of them worked on the land. We have some service records for the elder one, and since he seems to have survived the War, the one who was killed in 1916 must have been the younger. 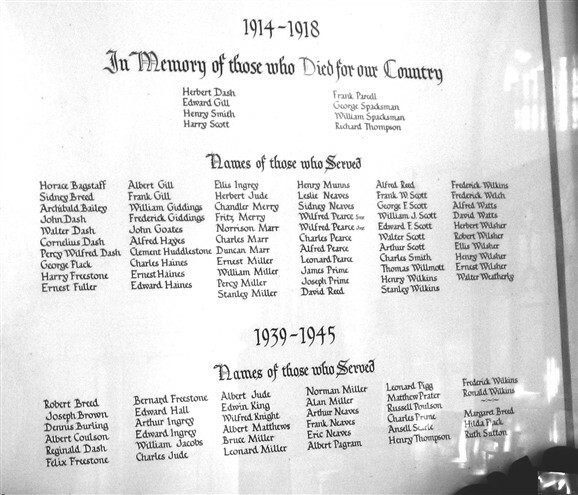 There is more information on The Roll of Honour. Henry Smith: Henry was aged 15 in 1911, and was living with his parents George and Claire in the High Street. He had three older brothers, Arthur, Charles and Albert, and one younger brother, Frederick, as well as two sisters. Harry Scott: Does not appear in the 1911 Census for Orwell, but was one of no less than seven of the children of Joseph and Decima Scott who went off to war. They were born and brought up at Malton Cottages, Orwell. See Roll of Honour for further details. 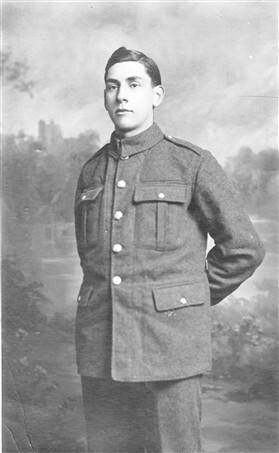 Frank Parcell: Frank was aged 20, and was working as a grocery assistant in Standon, near Ware. He was not married. He was born in 1891 in Orwell, to George and Sarah Parcell, and his older brother Herbert also served. There is some discrepancy over ages with the Roll of Honour, perhaps because three Parcell children were all baptised on the 1st May 1892. The Roll of Honour shows his death in 1917. George Spacksman: George is in the 1901 Census as living in Wimpole, his parents James and Bell (Isabel? or earlier given as Ellen) having come from Steeple Morden. In 1911 there was a Spacksman family living in Lotfield Street, and another one at Bassingbourn, but George must have moved away. His name, however, does not appear anywhere else in the country. The Roll of Honour has more biographical details including the award of the Military Medal for bravery. William Spacksman: The Roll of Honour gives his name as William Arthur Spacksman, born at Clapham. The Spacksman family originally came from Walthamstow, but the Census says that he was born in Cambridgeshire. He was a Stockman in 1911, living at Field Barns, Orwell with his Mother, who had re-married, and was Mary A. Chapman. Richard Thompson: Richard was aged 22, and lived with his Father and step mother in the High Street, Orwell. He gave his birthplace as Childerley, and was a farm labourer. He was also an Army reservist. The names are taken from the Board in the Church. Horace Bagstaff: This name does not appear at all in the 1911 Census, but his Army records show that when he enlisted in 1915, he was working for George Parcell at the Post Office in the High Street as a baker. He was married to Dorothy Alice. He returned to this job after the War. There are some military records of his service, mainly in connection with a gunshot wound to his right foot which he received on active service at Cambrai. He was 5' 5" in height, and weighed 131lbs, and was A1 fit. He was discharged to Z Reserve in 1919, and finally discharged in 1920. Sidney Breed: He was aged 19 in 1911, and was living with his parents John and Hepzibah Breed and his older sister Jeanette in the High Street, Orwell. His occpation was given as carpenter. The entry in the Roll of Honour is wrong. Archibald Bailey: Aged 15 in 1911, he lived in the High Street Orwell, and worked as a farm labourer. He was the son of John and Harriet, but his father had died, and Harriet was living with Charles Bailey (John's brother) and his family. Charles was a harness maker, while Archibald was an agricultural labourer. A grandchild, Begnell Bailey, was also living with them. He served in Italy, and survived the War without injury. Walter Dash: The Dash family lived at Malton Cottages, and in the Census the cottages were said to be in Meldreth, Orwell. They were actually at Malton, which is now definitely in Orwell Parish. Walter is given as the Father of the family, and is aged 48, so by the time the war started he would have been much too old to serve. However, the Parish Records show a Walter Dash getting married in 1922, so there might have been a younger Walter who did not show on the Census. The sons Cornelius and Percy both served, but the remaining son William is not on the active service list in the Church. Walter was a groom, and William was a stockman. Might the Census taker have confused Walter and William? Cornelius Dash: Born in 1890, and worked as a farm labourer. At Malton Cottages in 1911. Percy Wilfred Dash: Born in 1896, and worked as a farm labourer. At Malton Cottages in 1911. By 1912, he was apprenticed as a blacksmith to a Mr. Matthews of Mill Hill, and he signed up as a Territorial in the Middlesex Regiment. He was 5' 5" tall, and his chest was 35 1/2". By 1915, he had had enough of soldiering, and was posted missing as a deserter. There is no record of his ever being found. George Flack: We cannot positively identify this person on the 1911 Census. There was a Frederick George Flack, born in Eversden, who lived in Orwell, and who would have been of the right age. See Comments at the end of this web page. Florence Freestone: Florence is not named on the board, but not only did she serve in the forces, but her whole life was changed by WWI to a degree which could not possibly have been exceeded by anyone else in the village. Use this link for full details. Ernest Fuller: Orwell Parish Records show an Ernest John Fuller of Barrington marrying an Orwell girl in 1914. Ernie, as he was known here, lost a leg in the war so that he could not go back to his pre war job driving a steam engine, and instead became a shoe maker and repairer. His workshop was a hut in the garden of his house, Well Cottage, in the High Street, next to the lane up to the Clunch Pit. William Giddings: William was a carpenter and joiner, living in Stone Street, Cambridge. He was married with four children. Frederick Giddings: He was aged 25 in 1911, and lived with his elderly father Ebenezer in the High Street. He was an iron foundry employee - either working at the iron foundry in the middle of Cambridge in the Market Square, or probably at the Orwell Iron Works for the Cundall Paper Folding Company. 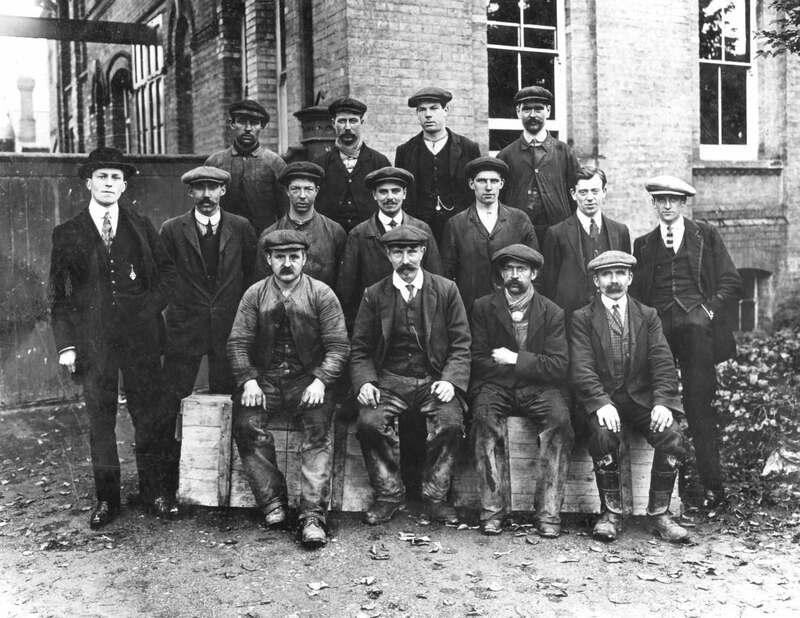 Iron foundry workers at Cundalls. Was Fred Giddings one of these? Albert Gill: There is a record of him in the 1891 Census, being born in 1874, the son of Daniel and Caroline Gill, of Blacksmiths Yard, High Street Orwell. Ernest Gill: We have some service records for this man. He declared his age on signing up in 1915 as 41. He was employed before signing up as a stoker by Tottenham UDC. Sent to France in 1915, he suffered an injury to his shoulder, in 1916, caused by his falling into a shell hole while carrying a stretcher. This was categorised as a strain, with no bony injury, but it was sufficient for him to be sent back to England. There is some suspicion that he was playing "the old soldier" game, as by 1918 he stated his age as 50, and claimed a pension on account of his injury. His former C.O. put a stop to that, stating that he fell during a running race and not during action. The injury was dismissed as 'trivial,' and he did not get his pension. Frank Gill: He is the brother of Albert above, born in 1882. His Father Daniel was an agricultural labourer. Reginald Gill: Reg does not appear on the board in the Church, but he was born in Orwell in 1888. In 1909, he signed up as a Territorial with the 2nd Royal Garrison Heavy Artillery in London, and trained with them until he joined the Army full time six months later. From that time, his records are under the name George Reginald Gill. He joined the 21st Lancers as a general labourer, and served in India from 1915 to 1918. In 1919, at Quetta, he transferred to the Tank Corps and remained in the Army until 1928, when he was retired with a Good Conduct and Long Service Medal, and a pension of two shillings and one halfpenny per day for life. The service records are cryptic, and some details here may be wrong. John Goates: The Goates family appears in the 1911 Census returns. John is aged 14 in 1911, and he lived in the High Street, Orwell, with his parents, Joseph and Lucy, and his brothers Arthur (aged 8) and William (aged 3.) Joseph was born in Kingston, and was a stationary engine driver. Charles Haines: Oddly, there is no mention of the Haines family, neither in the 1911 Census, nor in the birth death and marriage records of the Parish until well after WW 1. We cannot say how he came to be regarded as an Orwell man. A Charles Haines married a Wimpole girl, but was probably too old to serve in the war. There was a Haines family in Croyden as well. Edward Haines: The Parish records show Edward aged 31 in 1929 getting married to Ivy Haines. Edward was a cement worker, and listed as the son of Charles Haines. Alfred Hayes: Born in Orwell in 1888. In the 1901 Census, he was aged 14, living in the High Street, and working as a ploughboy. By the 1911 Census he had married and was living in Low Leyton, Essex, working as a carman (haulage). Clement Huddlestone: He was born at Caxton in 1894, was living in Orwell in 1901, but by the 1911 Census he had moved away to Poulton, Somerset. His Father, John, kept the shop in Town Green Road. Clement survived the Great War and married in 1926. Ellis Ingrey: Born in the village in 1880, but the 1911 Census shows only his elder brother Charles, and he had moved away to Tottenham. His parents Alfred and Rhoda may have still been in the area, but the Census Summary Books show a number of Mr and Mrs Ingreys without giving the christian names so it is difficult to see who is who. The proper Census records for 1911 have not been found. Herbert Jude: We have been fortunate in having sight of Herbert's service records. He was born in Winnipeg in 1884, the son of Charles and Emily, but in his military papers he gave his place of birth as Orwell. He signed up with the Royal Herts Artillery in February 1901 at Royston when he was aged 18, he and his parents having come to England by 1891. Having served for nearly two years in South Africa, he discharged himself and transferred to the Army reserve. 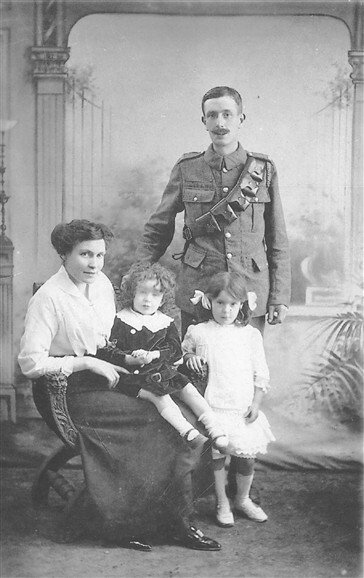 He re-enlisted in August 1914 at the start of the war as a private with the Suffolk Regiment. However, his service was short lived, because he was discharged in December 1915 as "no longer fit for military service." This was not due to wounds, and his conduct was recorded as "willing and trustworthy." He subsequently lived and died in a house in Lotfield Street, Orwell. Chandler Merry: The Merry family was large and well established, and the christian name Chandler goes back to 1734. This Chandler however was christened Joseph Chandler Merry, and was born in 1897. In 1911, his parents lived in the High Street, and his Father, Arthur, was a carpenter and undertaker. After the War, he married Elsie Miller in 1926. Fritz Merry: Born in Orwell in 1899, Fritz survived the Great War and married a girl from Whaddon (the next village) in 1924. In 1911, he was living at The White Hart, with his parents and siblings. Norrison Marr: The Marr family came from North Yorkshire, but Joseph Marr was farming at Malton Farm in 1911. Two of his children, Charles and Alfred Duncan (see below) were there as well, but Norrison Marr was perhaps included on the Orwell memorial board as well because of his parents. He was not born in Orwell, neither does he appear to have been resident here. Charles Marr: Charles was aged 12 in 1911, and lived at Malton Farm. His parents, Joseph and Mary, had moved down from Yorkshire to the farm in 1900, just after he was born. Duncan Marr: His full name was Alfred Duncan Marr, and in 1911 he was living with his parents at Malton Farm, which is now in the Parish of Orwell. He was born in 1895 in Yorkshire. Ernest Miller: He was born in 1900, and so was at school in 1911 at the time of the census. His parents, Alfred and Mary, were farming at Orwell but in 1901 Alfred was a cement burner, while Ernest's older brother was a bread bakers assistant. It is thought probable that Ernest's full name was Alfred Ernest Miller, in which case his service details are that he was born in Orwell on the 10th April 1900. His record card shows that he was 5'4" tall, with a 31" chest measurement. He served as a motor mechanic and was transferred from the Navy to the R.A.F. in the last few months of the First World War. William Miller: The only William Miller found was one born in 1890 at Wimpole, and living with his maternal grandparents in Town Green Road at the time of the 1901 Census. By 1911 he had moved away to Isleworth, Middlesex, where he was a grocer's assistant. Stanley Miller: He does not appear on the Parish Registers for Orwell, but in the 1911 Census is stated to have been born in Orwell in 1898, the son of Ellis and Eliza Miller. Ellis was a farmer, one of the sons was a motor engineer, while another worked as a fitter at the Cundell Folding Machine Co. Two other boys worked on the farm, while Stanley was still at school. Henry Munns: Henry John Munns was born in 1892, the son of Henry and Eliza. The Parish Records say "privately baptised." Could that indicate a baptism in the Methodist Chapel perhaps? Henry was a farm labourer in 1911, living in Town Green Road with his parents. Leslie Neaves: This is thought to be William Leslie Neaves, born 1899, who lived in the High Street with his parents William and Elizabeth. There were four other brothers. The Neaves family was a large one, based in Orwell and the nearby Barrington. A William Leslie Neaves was married in Orwell in 1933. Sidney Neaves: He was one year younger than his brother William Leslie Neaves, and was also at school in 1911. The 1911 Census gives details of the house size, so we can see that Sidney lived in a four roomed house, along with his parents, sister, and four brothers. This must have been quite spacious by the standards of the day! Wilfred Pearce Snr: Wilfred Ernest Pearce was born in Orwell in 1888, and was working as a journeyman butcher in Clapham Common in 1911. His father Charles was also a butcher, but he had retired by 1911 and lived in Green Street (Town Green Road). Wilfred Pearce Jnr: This Wilfred was aged 18 and living in the High Street Orwell in 1911 with his parents Henry and Agnes, and his four brothers and two sisters. They all fitted in to a four bedroom house! His occupation was given as labourer. Charles Pearce: He was born in 1893, the son of Mark and Hannah. Mark had been a coprolite digger in 1881, but reverted to farm work until his death in 1898. The family lived in the High Street Orwell, next door to Arthur Pearce and his family. Charles was no longer living at home by 1911, but he attended his sister's wedding in 1915. Alfred Pearce: Born in 1891, the son of Elias and Kezia Pearce. He was a carpenter in 1911, living with his uncle in Rock Road, Royston. His parents lived in Cambridge Road, Orwell, at that time. Leonard Pearce: Born in December 1896, the son of Henry and Agnes. They were living in the High Street in 1911, and Len had left school and was working as a farm labourer. He signed up for the Territorials in December 1915, but converted ("attested") to the regulars in 1916. In 1918, he was with the Royal West Kents, and was on his way abroad, but only got as far as le Havre although his records say he was going to Italy. He was 5' 9" tall, but only 31" in girth, so must have been lanky. In 1919, while still in the Army, he caught 'flu, and was then quickly discharged and came back to Orwell. The only other record in the files was that he was charged in 1962 with grievous bodily harm, and the local police enquired of the Army about his past conduct. The outcome is not known, but may well be in the local paper. James Prime: No connection with Orwell has been found. Joseph Prime: Joseph was living in Cross Lane, Orwell in 1911, with his parents William and Agnes. William was a general labourer, while Joseph was aged 11, and still at school. David Reed: There is a photo of David Reed and some of his family earlier on, in the introductory paragraphs on this page. 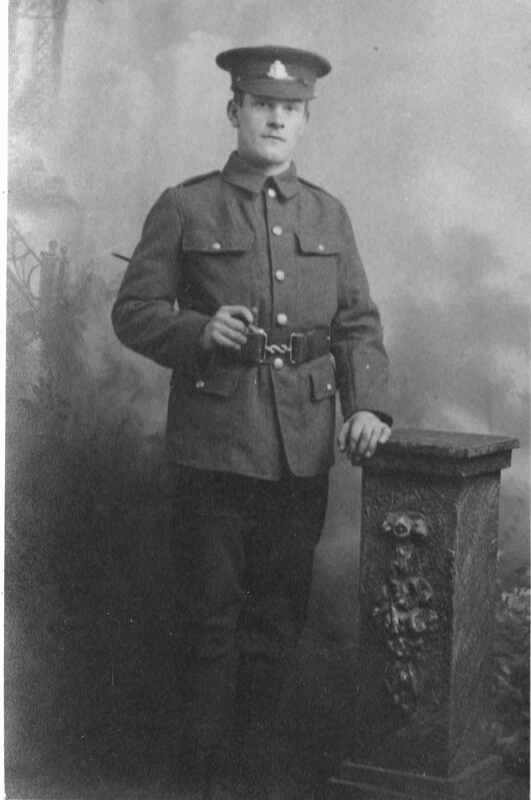 We have a record of a David Reed born in Orwell in 1878, but this seems too early for the age of the man shown in the photo, so the photo may possibly have been of David born in Whaddon in 1887, in which case he is not an Orwell soldier at all! Alfred Reed: Born in Orwell 1887. His parents were Arthur and Isabel. In the 1891 Census, Alfred was living in High Street Orwell with his brother David, who, at the age of 12, was an agricultural labourer, and by the 1911 Census, Alfred was married to Florence, a girl from Barley, and worked as a gardener at The Rectory. Arthur Scott: Fifteen at the 1911 Census, Arthur was an errand boy for a tailor in Market Hill, Royston. He was one of Joseph and Decima's seven boys who went off to war. See Henry John Scott (above) for further details. Edward Field Scott: Aged 21 in 1911, he was born at Malton in 1890, the son of Joseph and Decima Scott. He was a baker in Royston at the time of the 1911 Census. Frank W Scott: Christened Frederick, born in 1877, the son of Joseph and Decima Scott. Frank was a farm labourer in 1891, and had married and moved away to Tottenham by 1911. George Frederick Scott: He was born in Orwell in 1882, the son of Joseph and Decima. He was a bootmaker in Royston in 1911. Walter Scott: Yet another of Joseph's and Decima's sons who went to war! He was born in 1892. William J Scott: No details are known. Possibly, he was born in Great Stukeley, where his father was working for a time. Charles Smith: See photo of Charles' Brother Henry further back, and for details of the rest of his family. In 1911, they were all living in the High Street, Charles being a farm worker, and his Father a road worker. Thomas Wilmott: Thomas was baptized in 1887, the son of William and Eliza. In the 1901 Census, William was a drum tender on an engine, Thomas was a gardener, and his younger brother William was described as a "farmer's boy." Henry Wilkins: Born 1892, the son of Lillie and Edward, a horsekeeper. They do not appear in the 1911 Census, so the family must have moved away, but in 1901 they lived in the Turnpike Cottage on the edge of Wimpole. Lillie's name was given as 'Lucy' in 1901. Stanley Wilkins: Son of Walter and Julia Wilkins. Aged 9 in 1901. Baptized as Albert Stanley. He married in 1915 and died in 1981. Frederick Wilkins: Son of Walter and Julia, and aged 12 in 1901. The family has not been located in the 1911 Census. We have a record of a Frederick Welch being born in Orwell in 1880, his parents being Samuel (from Therfield) and Sarah Breed. They appear in the 1881 Census, but in later Censuses Frederick is missing, so it is possible that he was brought up elsewhere. It may even be the wrong Frederick. There is no mention of him in 1911 anywhere local. In 1916, he was a soldier at Rochester, and he travelled back to Orwell for a war-time marriage to Ethel May Scott. Alfred Watts: Born in 1878, the son of Alexander and Elizabeth Watts. 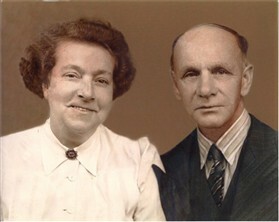 In 1911 he had been married for one year, and had gone with his wife to live in her widowed sister's house in Langford. He was working as a harness maker. David Watts: He was born a year before Alfred in 1877, and died in Orwell in 1940. In the 1891 Census, he is working as a grocery apprentice at Hextable, Kent, but apart from this, there is no trace of him between these dates. Hubert Wilsher: His entry in the 1911 Census shows he was born in Orwell in1885, and was working at the time in Cambridge as a Gentleman's valet. He had previously been recorded as a brickyard labourer, so this must have been quite a change! He had two young daughters. Robert Wilsher: The son of Daniel and Susan Wilsher, and aged 9 in the 1891 Census. In the 1901 Census he was working as a hall porter at a small boarding school in Guildford, and he signed up in 1915 at Wimbledon, where he was working as a gardener. Ellis Wilsher: Ellis is shown as having been born in Orwell in 1887, and was working as a bootmaker in Chesterton Cambridge at the time of the Census. He was recruited into the Bedfordshire Regiment, and later transferred to the Gloucesters. Ernest Wilsher: In 1901, he was aged 7. The son of John and Bertha Wilsher. John worked at the local cement works. Walter Weatherly: This name is unusual for Orwell, so it is no surprise to find that Walter was born in King's Langley. He married an Orwell girl, Mary Ann Ingrey, in 1906, and by the 1911 Census they were living at Toft with a six month old daughter. He worked as a carpenter. He joined up in 1915 at age 34, and is recorded as being 5' 1" tall. In May 1917 he was on leave at home, prior to being posted overseas to Egypt. It may be that he found it hard to tear himself away from his family, as he was two days late in returning to his barracks, ans was sentenced to 7 days CB. He was in the Machine Gun Corps to begin with, and later in the Royal West Kents. This page was added by David Miller on 21/02/2013. George Flack on the War Memorial of those who served is probably my grandfather, Frederick George Flack. I know he served in WW1 and have a record of his being in the Royal Engineers. I research my family and belong to 'Ancestry' and have records of the Flack and Breed families of Orwell. Alfred Pearce mentioned here, is my great grandad. I don't have any details of what he did in the war. He worked as a carpenter and married Hannah Prescott having a daughter Phylis and son Alfred. Sadly Hannah died shortly after giving birth to Alfred, but 10 years later Alfred senior married his late wife's older sister Helena Prescott, so they were raised by their aunty! They lived at The Woodlands 90 Hay Street Steeple Morden, where my dad has many memories of his time spent there as a child. I would still like to know how he met the Prescott family, as they were from Beer in Devon, but it was during the war.